There used to be a time when educational resources were limited to the boundaries of a library or university. However, the internet has changed all of that, and nowadays, it is really easy to find tutorials and helpful videos related to almost any niche or topic. In this article, we shall take a look at some of the most popular learning resources and websites. If you are looking to learn web development, look no further than W3Schools. The website has tutorials and learning resources related to every major aspect of web development, be it AJAX, HTML5, CSS3, PHP, jQuery, SQL or ASP. Beyond that, there is also an online certification program that can help you become an expert in the coding field of your choice. University of the People is a non-profit, tuition-free online university that offers higher education in multiple course streams, such as arts, commerce, science and technology. If you have a flair for learning and wish to get higher education but cannot afford the costly colleges and universities, University of the People can help you out. There is no tuition fee, though if possible, you are encouraged to pay $100 examination fee at the end of the academic tenure. 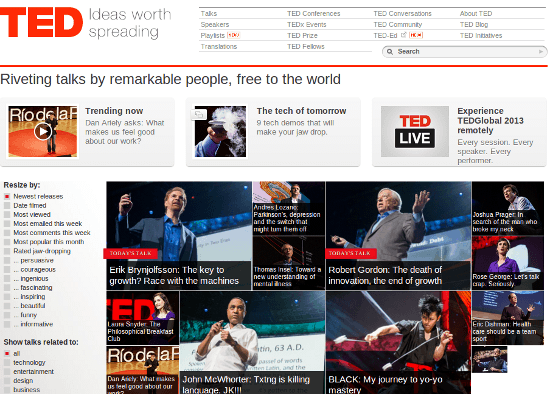 TED is your resource for cutting-edge discussions and talks on relevant matters. Covering a spectrum of topics that range from global issues, technology and design to entertainment, business and science, TED features great videos that show some of the leading names in the world share their expertise. No matter what your preferred topic is, rest assured, TED will have something educational and fruitful for you. Peer 2 Peer University, or P2PU, is an open educational project that helps you learn at your own pace. You have the option to create your own course, or choose from the several courses that are already available. P2PU is available in multiple languages. However, as of now, the content or list of courses is not really well populated (though over the course of time, you can find the number of courses rising). Also, you will need to register for an account in order to use P2PU. CK-12 caters primarily to school education. It has separate sections for students and instructors/teachers, and you will need to create an account in order to use the services. Basically, the learning is divided on the basis of subjects such as Science, Humanities and Mathematics, and so on. You can create lesson plans and learning modules for your students, and as a student, you have access to books and interactive videos as well as exercises. 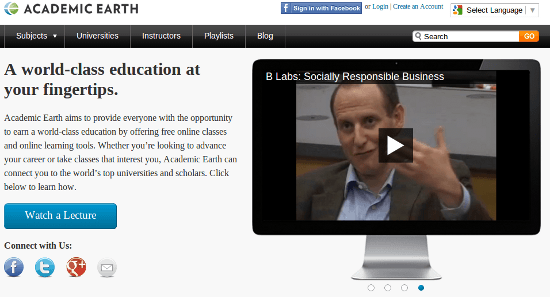 Academic Earth offers online classes and learning videos for free. The content and tutorials are provided by some of the leading universities and institutions in the world, such as Stanford University, Yale University, Dartmouth College and MIT. The list of subjects covered is huge, and includes History, Languages, Philosophy, Religion, Science, Maths, Engineering, Computers, Accounting, and so on. 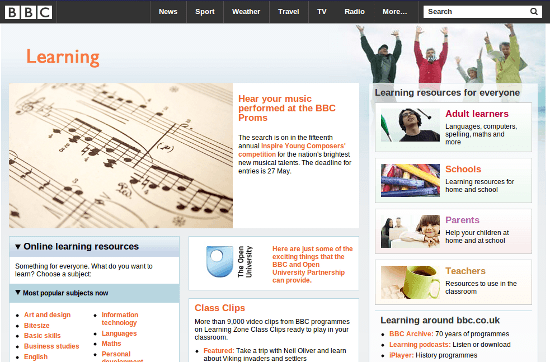 BBC Online Learning portal has various resources that cover multiple subjects. It offers podcasts as well as online courses to help you learn new things at your own pace. Plus, BBC has separate sections for school education and adult education. While the list of subjects is rather extensive, the USP of BBC Learning program lies in the language courses, which are available both online and in print. 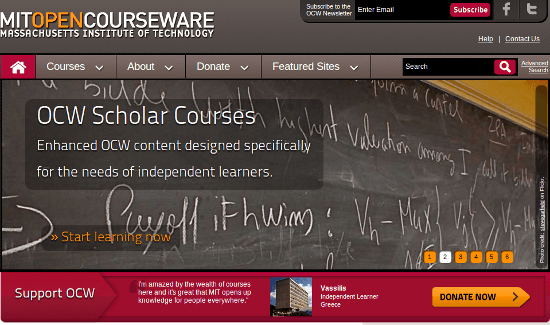 As the name suggests, MIT Open CourseWare is a catalog of free online courses and learning resources offered by Massachusetts Institute of Technology. Most of the courses are in the form of audio or video lectures, and the topics covered include Life Sciences, Environment, and Technology. Plus, most of the content has been localized in various languages, including Chinese, Portuguese, Thai, Persian, Turkish and Korean. 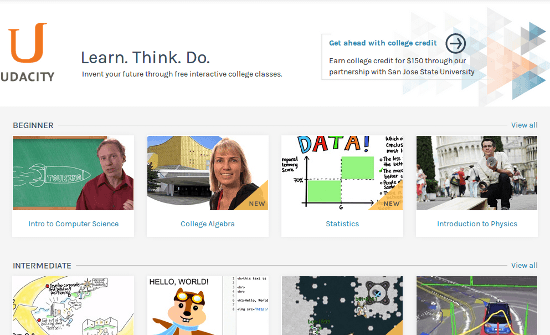 Udacity offers interactive online classes and courses in higher education. The topics covered are quite advanced, such as Robotics, Game Development, Artificial Intelligence, Cryptography and Parallel Programming. The course catalog is still in its initial stages, and more courses will probably be added over a period of time. 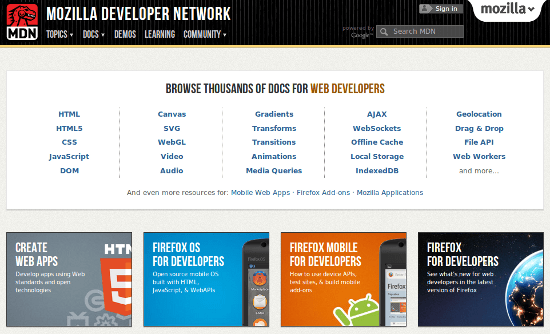 Mozilla Developer Network offers detailed documentation and learning resources for web developers. Apart from documentation and guides, Mozilla DN also has its own community for web developers as well as separate sections for Mozilla tools and mobile applications. 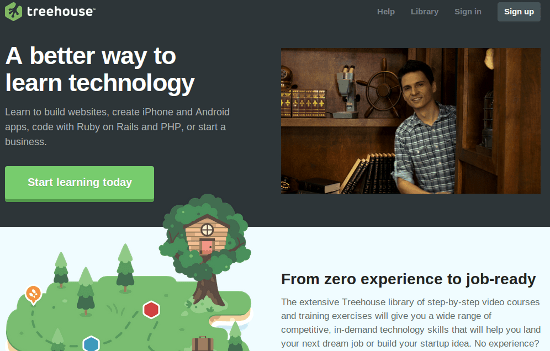 The Code Player offers tutorials and walk-throughs for those interested in learning web development. Most of the content is in the form of videos, though you also have detailed step-by-step textual guidelines. The Code Player is still in Alpha, so you will not find a lot of content on the site, though it is growing at a rapid pace and has already earned over a thousand subscribers. 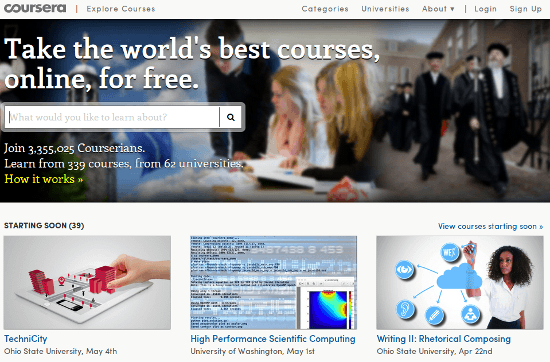 Coursera offers higher education online courses. Just like Academic Earth, Coursera too relies on several universities for its content — it currently has over 300 courses from 60+ universities, including the likes of University of Washington, Ohio State University, University of Pennsylvania and the National University of Singapore. Courses are offered in multiple languages, and cover a plethora of topics such as Genetics, Mythology, Medicine, Science, etc. Curated and managed by Envato, the Tuts+ Network offers a wide selection of guides, ebooks and tutorials to help you learn. There are separate websites for each topic, and the most popular ones include WordPress, Web Design, Mobile, Game Development, and Vectors. 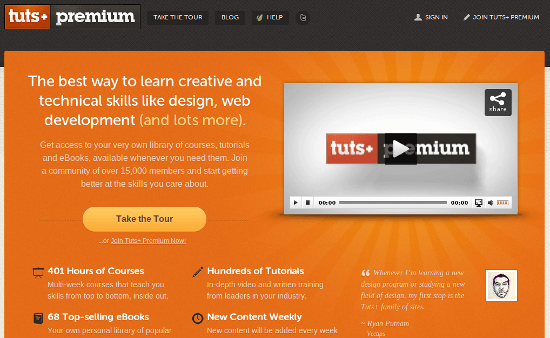 If you are looking to learn anything about design and development, Tuts+ Network should be on your reading list! 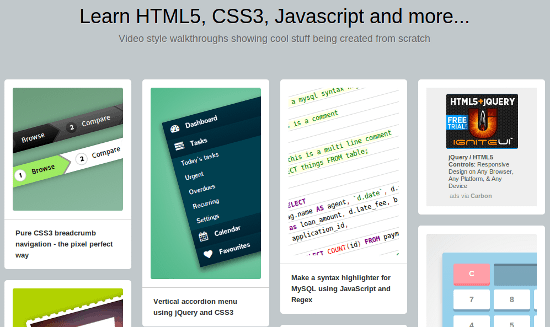 Codecademy does the obvious — teach people how to code. The languages covered include PHP, Python, Ruby and HTML/CSS. The courses range from beginner to advanced, and there is a separate section related to fundamentals and basics. 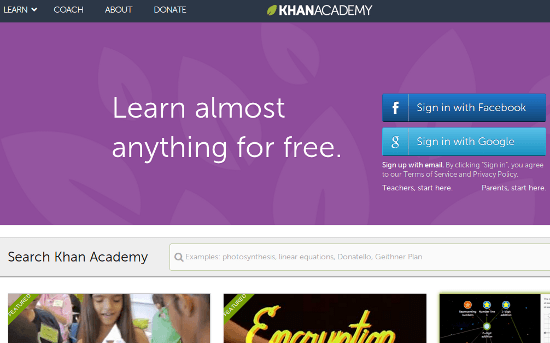 Khan Academy is a useful resource that offers courses and learning tools for subjects such as Science, Maths, Economics, History and Computers. Beyond that, Khan Academy also offers preparatory material and practice resources for competitive examinations and tests such as GMAT, California Standards Test, etc. The current library includes over 4000 videos as well as several practice exercises, and it offers separate sections for teachers and parents/instructors. Edublogs has various signup options, including a free plan. Sadly, the free plan is severely limited: 32 MB storage. The Pro plan comes with 10 GB storage, premium themes and email support, and costs $39.95 per year. eHow offers how-to guides and DIYs for various topics, generally catering to lifestyle and living rather than learning. However, it also has certain useful practical guides such as those related to Finance, Legal and even Health. So if you are looking for a general piece of information that has more to do with daily life rather than studies (the website also has grocery guides, by the way), eHow can be a good place to start. 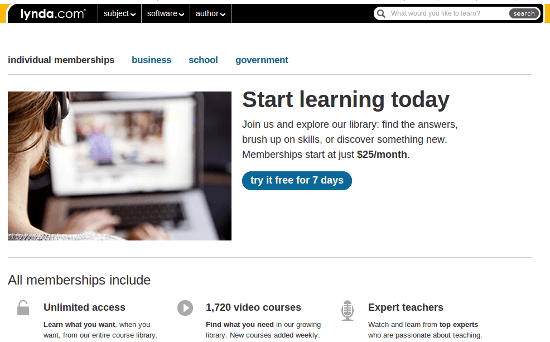 Moodle is not really a learning resource or tutorial collection in its own right. It is a full-fledged CMS that helps you set up learning websites. 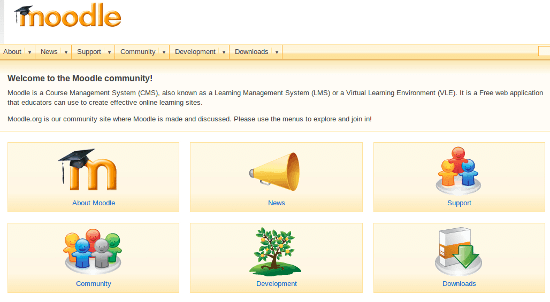 Thus, Moodle can also be called an LMS — Learning Management System. It can help you create your own learning community or resource website. The software itself is totally free and open source. About.com serves more or less the same purpose as eHow (though About.com also has an awesome domain name). It offers detailed tutorials and guides as well as DIYs for a wide range of topics, ranging from religion to email as well as daily living such as dessert recipes and even pedicure tips. 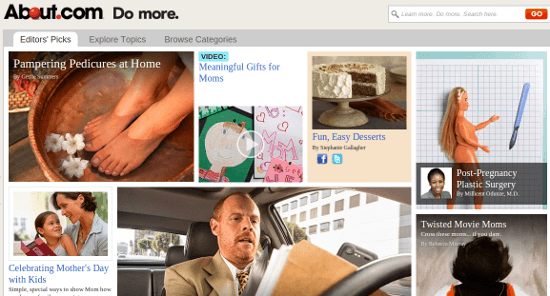 lynda.com offers video tutorials to help you master new skills. The collection at lynda.com currently has over 1700 video courses, and the topics covered include 3D Animation, Design, Photography, and so on. There is a 7-day trial to help you assess lynda.com and its offerings before you decide to subscribe. Got a website or learning tool that we missed here? Share it with us in the comments below! Now that’s what I’m talking about continuing education! Great list of resources. The Code Player is a favorite. Why you would list W3schools as a resource is beyond me. Clearly, you have not done your homework when writing this article. W3schools is one of the most detrimental “education” sites on the web and does nothing to promote newer, up-to-date standards. 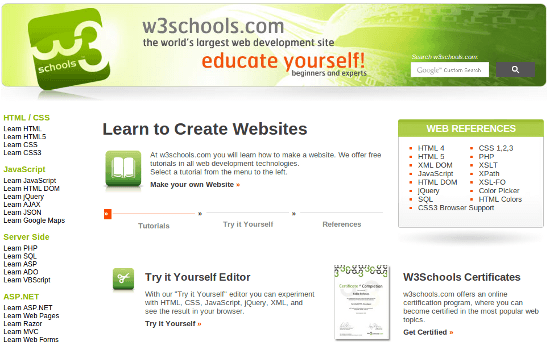 “W3Schools is optimized for learning, testing, and training. Examples might be simplified to improve reading and basic understanding. Do yourself a favor and replace W3schools with W3fools and go read W3fools and understand and learn the reason why W3schools is a poorly constructed monolithic detriment to the web development world.